The Arequito revolt (Spanish: Motín de Arequito) (Arequito, Santa Fe Province, Argentina, January 8, 1820), was a military revolt by officers of the Army of the North, through which they recused themselves from the fight in the civil war against the federals. Their intention was to return to the front of the war against the royalists in Upper Peru, an objective they could not ultimately meet. It signified the beginning of the disintegration of the Supreme Directorship and was one of the main causes of the centralist defeat at the Battle of Cepeda. The successive Argentine governments since the May Revolution tried to govern all the provinces that comprised the Viceroyalty of the Río de la Plata citing the argument that when the king's governance ceased, its rights reverted to the people. Starting with the dissolution of the Junta Grande, it was clear that the desire of the city of Buenos Aires was to dominate the country, with as little input from the other cities as possible. The cities from the interior of the country, in the name of their respective territories, insistently requested to have equal participation in the national government and to elect their own local governments. For years, the different governments from Buenos Aires made an effort in the opposite direction: all the governors were appointed directly by the central government, and the city of Buenos Aires' representation was always greater than the rest in the assemblies that followed. On the other hand, several of the central governments fell by Coup d'état's organized in Buenos Aires exclusively, and the national government that followed each, was invariably named by the cabildo of Buenos Aires. The reaction of the interior provinces was surprisingly slow but inevitable. The first effective response to the porteño control came from the Banda Oriental (present-day Uruguay), where the caudillo José Artigas denied the capital the right to govern his province. In 1815, after more than a year of civil war, he gained complete control of the Provincia Oriental. His example was followed by the bordering provinces, starting with Entre Ríos, where several caudillos deposed the governors placed by the Directory; with Francisco Ramírez as the leader in the province. A little later Corrientes Province followed and separated from obedience to the central government. The dissent followed to Santa Fe Province, which revolted against porteño dominance in 1815 and again in 1816 under the command of Mariano Vera, later succeeded by Estanislao López. The central government vehemently denied them the right of separation, as its territory was the obligatory route of communication with the interior of the country. No less than five military expeditions were launched from Buenos Aires to crush Santa Fe's resistance, but none succeeded. The Northern provinces followed suit, Salta established an autonomous government under general Güemes, the Province of Cuyo refused the replacement of their governor José de San Martín, and Córdoba elected their own governor José Javier Díaz, a follower of Artigas. The Army of the North was formed to fight the War of Independence against the Spanish Empire in Upper Peru; but after the third defeat at the Sipe Sipe, was left weakened and with a single base at Tucumán. In theory, its mission was to wait until the conditions permitted to restart the reconquest of the provinces in Upper Peru. The Directorio decided to use the army to suppress internal rebellions in 1816, a fraction of the army was used to reinstate the governor of La Rioja Province, and at the beginning of the following year, the governor of Santiago del Estero Province. A little later, another part of the army helped deposed the governor of Córdoba Province and support his successor. In 1818, director Pueyrredón decided to suppress Santa Fe Province with a double attack: while an army attacked from the south, a division of the Army of the North advanced from the west. The initiative failed before the quick defense of Estanislao López, who capture the commander of the west column from Córdoba, Juan Bautista Bustos and then succeeded in repelling the attack from the south. Another similar attempt was thwarted in 1819. The bulk of the Army of the North was established in Córdoba, tio the annoyance of many of their members, as it was far from the royalist enemies. In April, a peace treaty signed between the governments of Buenos Aires and Santa Fe gave hopes of a solution to the internal quarrels, and the offices believed they would go back to the north front. The treaty pacified its signatories, but nor Artigas (who considered himself López's superior) nor the Directorio were pleased. Artigas wanted the national government to unite against the Portuguese, who had invaded his province, from Brazil. The new Supreme Director, José Rondeau, wanted to defeat Santa Fe with help from the Portuguese. He called in the Army of the Andes, but its commander, San Martín refused to obey. He also ordered the commander of the Army of the North, Manuel Belgrano, who initiated a march towards the south. By order of Artigas, Ramírez crossed the Paraná River and invaded the north of Buenos Aires Province, later retreating. Rondeau organized his army in the capital and marched to meet the threat. The Army of the North entered Santa Fe Province. Arriving at Arequito, on January 8, 1820, general Bustos, supported by colonels Alejandro Heredia and José María Paz, directed the military rebellion. The arrested colonels Cornelio Zelaya and Manuel Guillermo Pinto in the middle of the night and traveled to a short distance from Fernández de la Cruz encampment and decided to have discussions with him. They told him they refused to continue with the civil war and to go back to the north front against the royalists instead. They explicitly declared themselves neutral in the conflict between the federalists and the Directory, to avoid being accused of having supported the enemy. Bustos had at this time about 1,600 men, and Fernández de la Cruz, a little less than 1,400. Bustos demanded to receive half their armament, munitions and head of cattle, to what Cruz seemed to accept at the beginning. But at noon he started a march towards the south, without having delivered the promised goods. Bustos ordered Heredia to pursue his former commander, and he reached him when he was already surrounded by López's federalist troops (they were already in Santa Fe Province, a federalist stronghold). Seeing he could not continue forward, Fernández de la Cruz decided to give his army to Bustos and returned to Buenos Aires almost alone, only followed by a few loyal officers, Lamadrid among them. The weapons of the motherland, distracted from their main objective, as they were not used but to spill the blood of their citizens, the same ones from which sweat and labor insured their subsistence. This means, the same sentiments that Bustos and the other participants of the Arequito rebellion had. Rondeau confronted Ramírez and López with its own forces at the Battle of Cepeda and was thoroughly defeated. Only a week later, he resigned and dissolved the Congress of Tucumán. There was not to be a new Supreme Director, due to pressure from López and Ramírez, Buenos Aires designated a provincial governor who signed the Treaty of Pilar with the federalists. While in Córdoba, Bustos learned of the end of the Directorship, and he started a campaign to reorganize the country, delaying the return of the Northern Army to the northern border. At the same time, interim governor Díaz announced he was thinking of an association with the Littoral Caudillos (Santa Fé, Entre Ríos and Corrientes Provinces) in their fight against Buenos Aires; that is, to sign some alliance pact with José Gervasio Artigas, Ramírez or López. That was not Bustos' objective, so he actively opposed Díaz' policies. Looking for allies, he reached the federalists of Juan Pablo Bulnes, who were distanced from Díaz's group, and various local politicians and influential local businessmen. With their support he was elected governor on March 19. Bustos then dedicated himself to govern and organize the Province, and he mediated between López and the Buenos Aires Province government, who were still confronting each other. He sent colonel Heredia with a portion of the army to the provinces of the north, as an advance party of the promised march to resume war with the royalists. Unfortunately, Heredia did not get to fight the Spaniards, as his force was used by Martín Miguel de Güemes in the rebellion against the governor of Tucumán. The remaining forces were used for the defense of the Province against the Pampas and Chaco native tribes and, the following year, to repel the combined attack of Francisco Ramírez and José Miguel Carrera. The Arequito Revolt was reported by early historians in a bad light. The chronicles by Lamadrid and Paz, labeled it as treason to the motherland or as an obscure event organized to place Bustos in the Córdoba government house and nothing more. Historians in the second half of the 19th century, starting with Bartolomé Mitre and Vicente Fidel López accused him of both. Nobody dared to defend Bustos and his followers, and as the defeat of the federalist party in the civil wars carried forward their enemies, this point of view was the one which survived. Many years later, the school of Argentina historical revisionism started to see the Arequito Revolt with different eyes. Also, Córdoba historians valued their first autonomous governors, who had supported or participated in the events. At mid-20th century, with the historical revisionism firmly established, and with the apogee of the historical overvaluation of San Martín (who also had refused to participate in the civil war), the Arequito Revolt was seen as an important step in the formation of modern Argentina. In effect, the rebellion of the Army of the North permitted the provinces to impose their will for the first time over the central government in Buenos Aires, made the strange and almost monarchist unitarian party constitution of 1819 disappear, permitted the birth of the autonomous government in Buenos Aires Province, equalized the rights of the people, and opened the way for an equal treatment and relations between the provinces (path that will prove to be difficult, as it would still need 50 more years of civil wars in Argentina). Possibly, if the Army of the North would have followed its path to the north, the war between Buenos Aires and the federalists from the Litoral provinces would have lasted much longer, and the inevitable formation of a modern federalist Argentine nation would have been more difficult. It is without doubt that the rebellion was an act of military disobedience, which, seen from a military point of view is totally inadmissible, but considering its political causes and results, it was a positive step towards a democracy with equal right for all. Serrano, Mario (1996). Arequito: ¿por qué se sublevó el Ejército del Norte? (in Spanish). Buenos Aires: Ed. Círculo Militar. López Rosas, José R. (1981). Entre la monarquía y la república (in Spanish). Buenos Aires: Ed. La Bastilla. Bischoff, Efraín (1989). Historia de Córdoba (in Spanish). Buenos Aires: Ed. Plus Ultra. Núñez, M. (1975). "Bustos, el caudillo olvidado". Cuadernos de revista Crisis (in Spanish). Buenos Aires. Paz, José María (2000). Memorias póstumas (in Spanish). Buenos Aires: Ed. Emecé. Aráoz de Lamadrid, Gregorio (1895). Memorias (in Spanish). Buenos Aires. López, Vicente Fidel (1954). Historia de la República Argentina (in Spanish). Buenos Aires: Sopena. Mitre, Bartolomé (1947). Historia de Belgrano y de la independencia argentina (in Spanish). Buenos Aires: Ed. Estrada. Busaniche, José Luis (1969). Historia argentina (in Spanish). Buenos Aires: Ed. Solar. José Gervasio Artigas Arnal was a national hero of Uruguay, sometimes called "the father of Uruguayan nationhood". Juan Facundo Quiroga was an Argentine caudillo who supported federalism at the time when the country was still in formation. Juan José Viamonte González was an Argentine general in the early 19th century. Estanislao López was a caudillo and governor of the province of Santa Fe, Argentina, between 1818 and 1838, one of the foremost proponents of provincial federalism, and an associate of Juan Manuel de Rosas during the Argentine Civil War. He is considered an iconic figure in Santa Fe and one of the most influential political actors in the Argentine conflicts of the 1820s and 1830s. The United Provinces of the Río de la Plata, earlier known as the United Provinces of South America, a union of provinces in the Río de la Plata region of South America, emerged from the May Revolution in 1810 and the Argentine War of Independence of 1810–1818. It comprised most of the former Viceroyalty of the Río de la Plata dependencies and had Buenos Aires as its capital. The Federalist Party was the nineteenth century Argentine political party that supported federalism. It opposed the Unitarian Party that claimed a centralised government of Buenos Aires Province, with no participation of the other provinces of the custom taxes benefits of the Buenos Aires port. The federales supported the autonomy of the provincial governments and the distribution of external commerce taxes among the provinces. Brigadier General José María Paz y Haedo was an Argentine military figure, notable in the Argentine War of Independence and the Argentine Civil War. The Treaty of Pilar was a pact signed among the rulers of the Argentine provinces of Santa Fe, Entre Ríos and Buenos Aires, which is recognized as the foundation of the federal organization of the country. It was signed in the city of Pilar, Buenos Aires on 23 February 1820 by governor Estanislao López for Santa Fe, caudillo Francisco Ramírez for Entre Ríos, and provisional governor Manuel de Sarratea for Buenos Aires, after the dissolution of the national government caused by the Battle of Cepeda. A reference to it was included in the Preamble of the Argentine Constitution of 1853 as one of the "pre-existing pacts" fulfilled by it. Martín Miguel de Güemes was a military leader and popular caudillo who defended northwestern Argentina from the Spanish during the Argentine War of Independence. 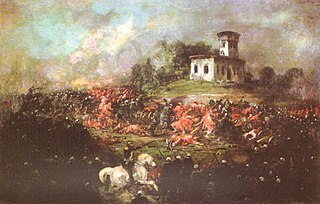 The Battle of Pavón was a key battle of the Argentine civil wars. It was fought in Pavón, Santa Fé Province, Argentina on 17 September 1861, between the Army of the State of Buenos Aires, commanded by Bartolomé Mitre, and the Army of Republic of the Argentine Confederation commanded by Justo José de Urquiza. The withdrawal of Urquiza left the field to Mitre. The Federal League or League of Free Peoples was an alliance of provinces in what is now Uruguay, Argentina and Brazil that aimed to establish a confederal organization for the state that was emerging from the May Revolution in the war of independence against the Spanish Empire. Manuel de Sarratea,, was an Argentine diplomat, politician and soldier. He was the son of Martin de Sarratea (1743-1813), of the richest merchant of Buenos-Aires and Tomasa Josefa de Altolaguirre. His sister Martina de Sarrateas (1772-1805) married Santiago de Liniers, vice-roy del Rio de la Plata. The Unitarian League also referred as the League of the Interior was a league of provinces of Argentina led by José María Paz, established in 1830, aiming to unite the country under unitarian principles. It comprised the provinces of San Luis, La Rioja, Catamarca, Mendoza, San Juan, Tucumán, Córdoba, Salta and Santiago del Estero. It was opposed and ultimately defeated by the provinces of the Federal Pact. Juan Felipe Ibarra was an Argentine soldier and politician. He was one of the caudillos who dominated the Argentine interior during the formation of the national state, and ruled the province of his birth for decades.